DODGE CITY, Kan. – The table is set for a six nights of world-class competition during the 40th year of Dodge City Roundup Rodeo. 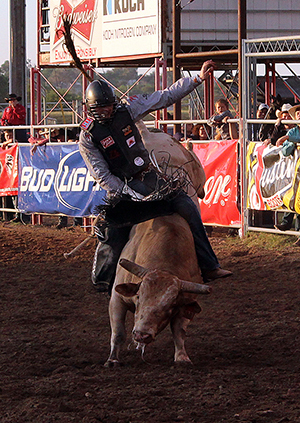 The festivities begin at 7:45 p.m. Tuesday, Aug. 2, with a day full of steer roping and an evening of A Whole Lotta Bull: It will feature the top bull riders in ProRodeo during an Xtreme Bulls Tour stop and the greatest freestyle bullfighters in the game during the Bullfighters Only contest. Cody Teel, the 2012 world champion bull rider, competes during last year’s Dodge City Roundup Rodeo. He is one of many world champions who are part of the annual rodeo. That showcase will be followed by five nights of championship rodeo that everyone in southwest Kansas knows as Roundup Rodeo, Dodge City Roundup Rodeo, set for 7:45 p.m. Wednesday, Aug. 3-Sunday, Aug. 7, at Roundup Arena. The cowboys and cowgirls understand. Hundreds of ProRodeo contestants – including the greatest in the game – make their way to Ford County every summer to be part of the field. Dodge City is a gateway to the Wrangler National Finals Rodeo, which features only the top 15 contestants in each event. It’s where millions of dollars are paid out over 10 nights in Las Vegas and where the annual world champions are crowned. Because of its status in the rodeo world, Roundup is home to the sport’s greatest stars each year. That includes the amazing livestock. Frontier Rodeo’s Medicine Woman – which has been named the Saddle Bronc of the Year in 2011, ’14 and ’15 – has guided cowboys to the highest mark rides each of the past two seasons, both times inside Roundup Arena. That’s not the only award-winning aspect of this year’s Roundup Rodeo, which has been named Rodeo of the Year nine times; also in the mix is rodeo clown/entertainer Keith Isley, one of the most decorated men in the business. He has been awarded Clown of the Year and Coors Man in the Can six times each, and has been a specialty act of the year 11 times. It shows not only in the quality of Roundup Rodeo but also in its legacy. Four years ago, the rodeo was enshrined into the ProRodeo Hall of Fame. It’s an accomplishment that most ProRodeos can only dream about, but Dodge City’s rodeo will be encased in the Colorado Springs, Colo., museum for many years to come.